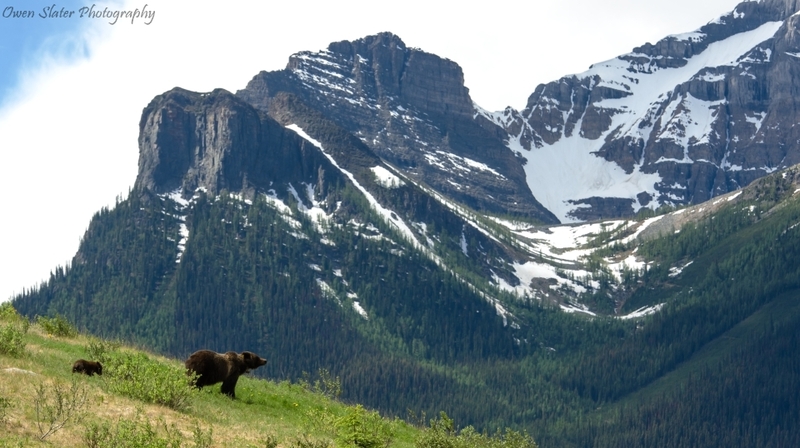 One could be forgiven for thinking that even the grizzly bears in Banff take a break from their daily routines to appreciate the mountain scenery. 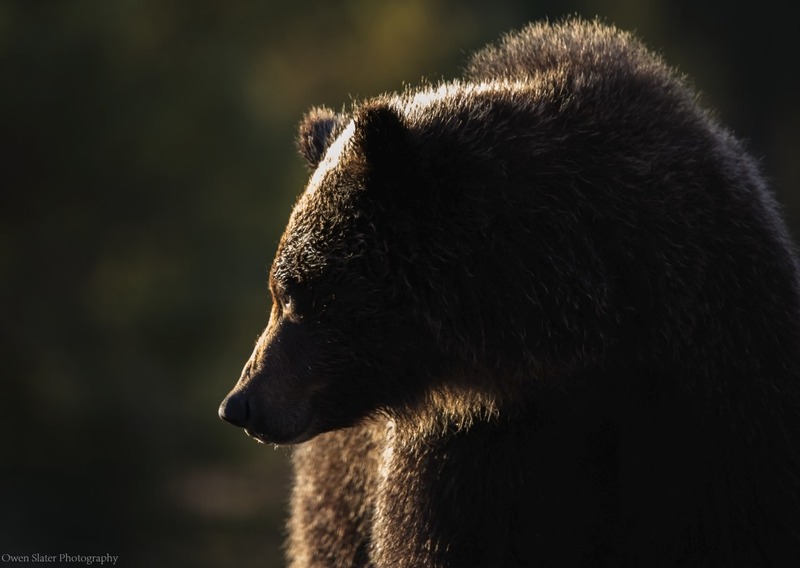 While I will never discount the fact that other animals can appreciate their surroundings, what’s more likely is that this bear is smelling the air for any potential threats or food options. I took this photo last month near one of the most popular places in Canada; Lake Louise. Bear 138 as she is known to park biologists, was feasting on one of the only spring food sources available to the bears; dandelions. Imagine how many dandelions a 150-200kg lactating grizzly bear would need to eat to produce enough milk to feed her two cubs? Needless to say, it’s a staggering amount. When they enter their hyperphagic state later this month, they eat about 35,000 calories a day. To put that in perspective, the average person eats about 2000 calories daily! Almost all of these calories are from berries, with a single bear eating between 200-300,000 berries per day to put on enough fat to survive the winter. That’s the equivalent of you or I eating 63 hamburgers daily! Yet these bears suffer no heart disease or complications association with high cholesterol. This only touches the tip of the iceberg of all the interesting adaptations of bears, but I hope you agree that these are amazing animals and deserving of our respect and protection. Just like a kid (or a big kid) trying to balance themselves while walking along the railway tracks or a parking rail, this 3 year old grizzly seemed to prefer to move between feeding sites by sauntering along a bunch of dead-fall trees than following his siblings through the grass. 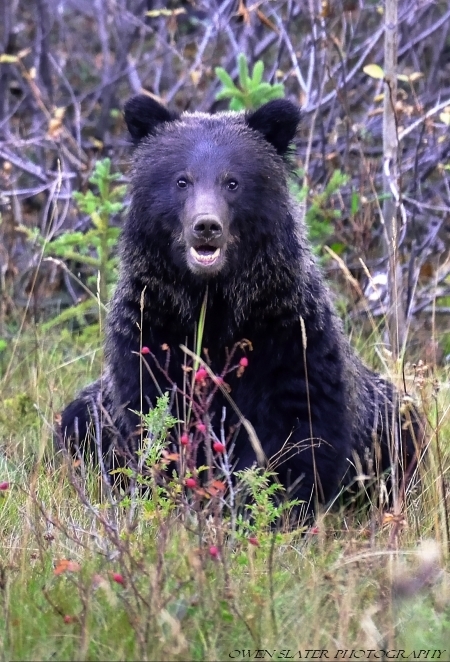 A grizzly cub appears to smile at the site of berries still available for eating in late October. This very spot is now covered in over a meter of snow and her and her family have long since found a den to comfortably sleep away the winter. During dusk and dawn when wildlife are usually more active, I spend most of my time in the car since it serves as a natural blind that animals are less likely to react to. Obviously, this involves a lot of sitting so after several hours I need to stretch my legs. With some of the best scenery around, it is not hard to find somewhere to hike and take photographs. On this particular day I loaded my gear into my backpack, made sure I had my bear spray and headed out with camera in hand. As I came around a clump of spruce trees I spotted some movement in the thickets about 200 feet away. I immediately retraced my steps back into the shadows of the trees to not be as visible and from there I was able to get a good enough look to figure out that it was a large grizzly coming in my general direction. It wasn’t until I had my bear spray in hand that I called out and stepped into the open to alert it to my presence. Only then did I notice an adult wolf was only a few feet behind the bear! Before I had time to take any photos, the wolf disappeared back into the thicket, while the bear stopped and went up on its hind legs to get a better look at me. Facing the bear, I slowly backed away. The bear went back down on all fours, turned to its right and ambled off while I retraced my steps back the way I came. I’m sure the wolf was watching everything from a distance making sure that both the bear and I continued out of the area. I drove out to Banff last Friday in the hopes of seeing some wildlife. Almost immediately I knew it was going to be a good day for wildlife spotting. Within a few hours I had spotted 12 mountain goats and seven different grizzlies. 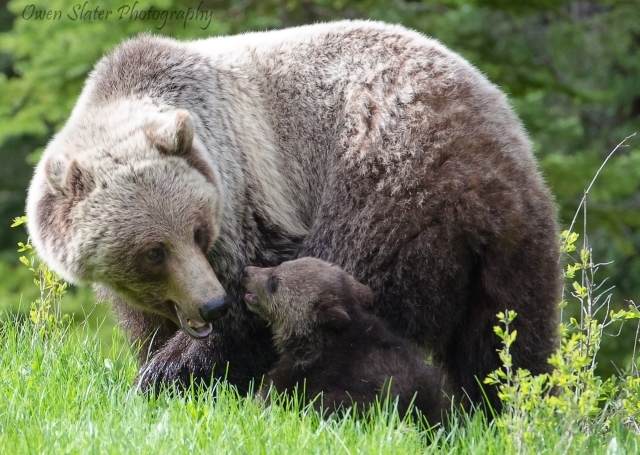 It was capped off by seeing and photographing the very shy grizzly mom known as bear 130. I had seen her a few times this year and I couldn’t believe how healthy and big her cubs had gotten. 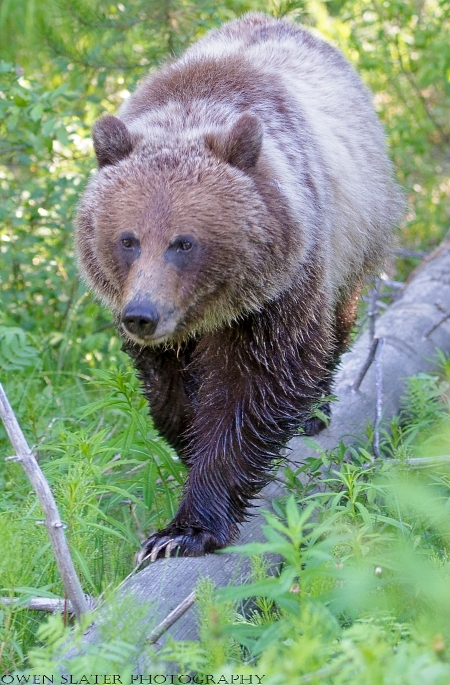 Bear 130 was given that name this spring when she was anesthetized to place a GPS collar on her as part of the CP rail and Parks Canada initiative to study grizzly bear mortalities in Banff National Park. 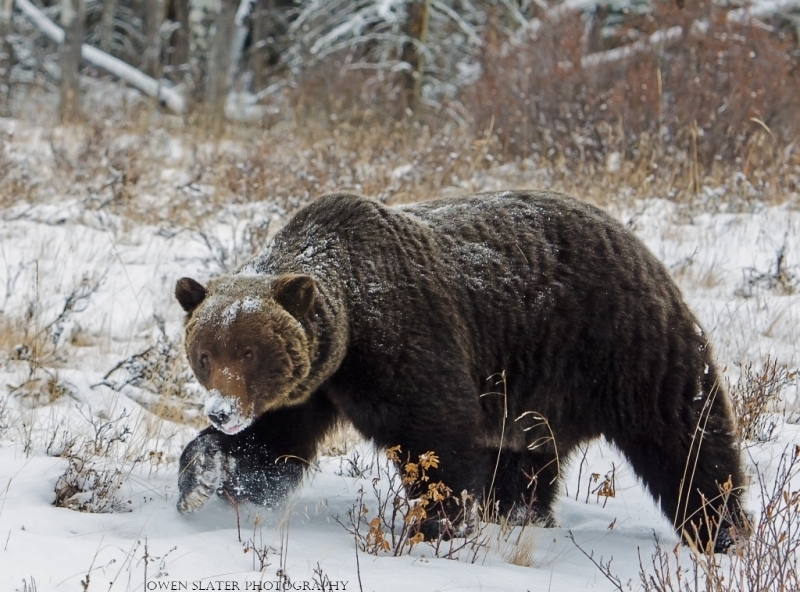 Train strikes are the leading cause of death to grizzly bears in the park and every year a few are lost. Up until this weekend, for this year there had not been any known grizzly bear deaths associated with the trains. However, moose, deer, black bears and just last weekend a wolf pup had all been killed by the train, so it seemed like it was only a matter of time before a grizzly would meet the same fate. Unfortunately, Friday night around 8:45pm was that time. Less than a two hours after taking this photo, these two cubs were hit by a train and instantly killed. Initially it wasn’t know if bear 130 had survived as she wasn’t seen for at least a day afterwards. However, on Sunday morning I was relieved to spot her walking along the tracks and quickly reported the sighting to Parks Canada staff who were thrilled to hear she was alive and well. That morning, she did not stop to feed on grain spilled between the tracks. Instead, she walked back and forth sniffing the rails, likely picking up the lingering scent of her now deceased cubs. She stayed in the area for days on end, and while we can’t know for sure why, I don’t think it is a stretch to assume it was likely because she was searching for her cubs. While the loss of two cubs is horrible, the loss of a reproductively active female would have been devastating, especially seeing as bear 130 is such a good mother that does an excellent job of staying away from high human use areas until people are not present. A testament to her skills were that both cubs were in excellent condition, and seemed to be thriving until they made a mistake. 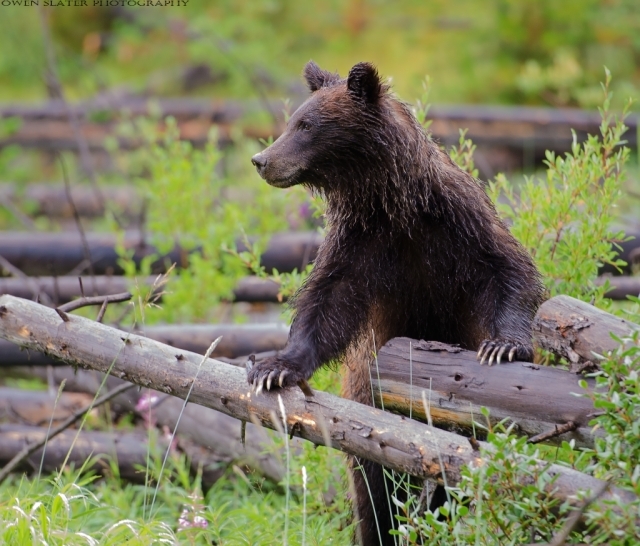 A one and half year old grizzly cub stands up to get a better vantage point of his surroundings. This year has produced a bumper crop of buffalo berries which when coupled with the high snow fall at higher elevations has resulted in the bears staying in the valleys for longer than normal. Having such long and powerful claws is of no use when feeding on the small berries. Instead, they use their very dexterous lips to grasp the berries off the stems. In an average day, an adult grizzly can consume about 200,000 berries! After sniffing the area, this big male decided that the fresh dandelions were more tempting than getting into a battle with an equally large female with cubs. Although this bear was pretty big he was not the biggest in the area. Later in the afternoon, bear 122 (based on a ear tag), a larger, more experienced bear showed up and quickly displaced this bear (known as “Split Lip” due an old gash over the left upper lip), from the area. If the female had been around and cycling it likely would have been a much more combative fight. Instead, Split Lip sprint down and hill and out of range from 122 before any damage could be done. 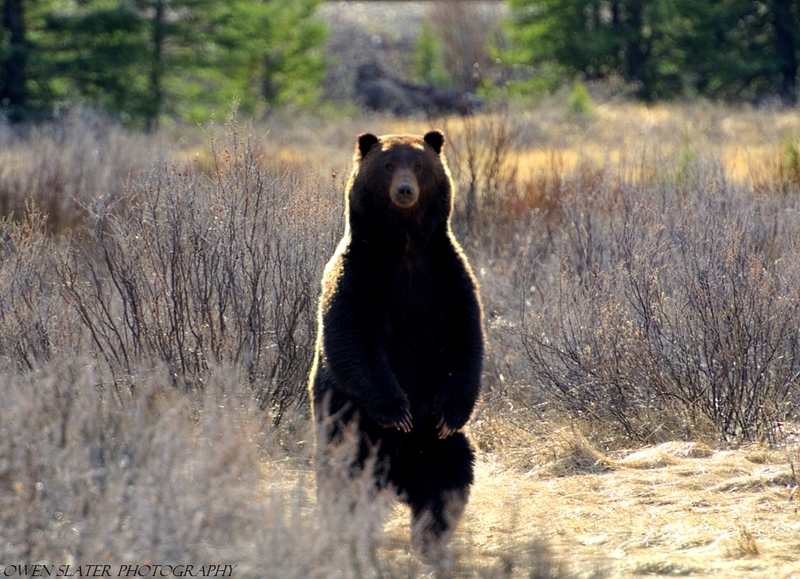 My luck at finding bears swimming or cooling off in lakes and streams around Alberta continued this fall. I hiked I short distance to a wildlife corridor passing under the Trans Canada Highway adjacent to the Bow river and couldn’t believe my luck. 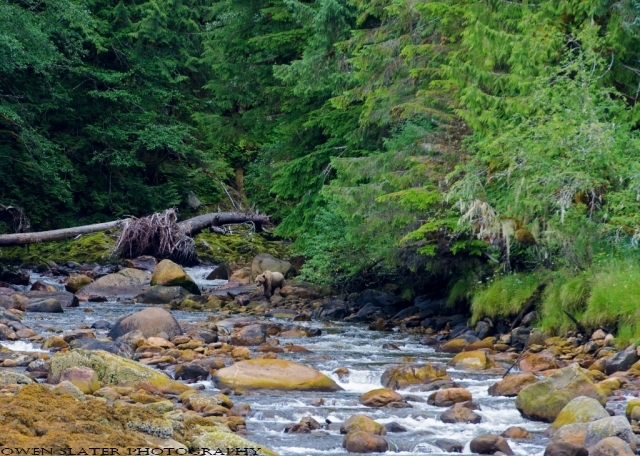 Just across the river was a big male grizzly walking along the bank. I fumbled with my camera which must have made enough noise and movement that he spotted me and took a few brief quick steps before deciding I wasn’t anything too intimidating. I figured he was going to continue along the bank around the corner and disappear into the thick bushes. I lost sight of him for a few moments and started walking back to my car thrilled that I had seen even just a brief glimpse of him. When I came around the corner I couldn’t believe that he had jumped into the river and was swimming across it! I ran down the bank to try and get some decent photos but I was too high up on the opposite bank and the sun was directly in front of me so I didn’t get very good pictures. This one was taken as he hauled out of the freezing water and made his way into the thicket.